Artist, teacher and indigo farmer Rowland Ricketts has transplanted centuries-old Japanese growing and dyeing techniques to Bloomington, leaving vibrant color in his path. 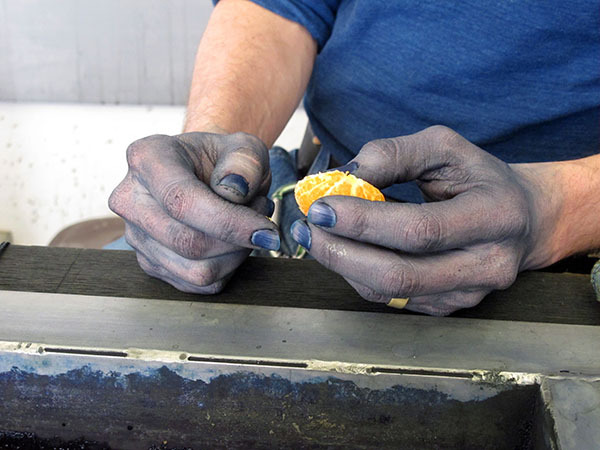 Rowland peels a clementine while taking a break from dyeing in the studio. His blue hands sometimes garner questions and quizzical looks from the public. A SMALL PLASTIC timer, its white surface stained with faint blue splotches, sits near the edge of a four-foot tall vat of dye. It beeps, and Rowland Ricketts darts across his studio to silence it. He reaches into the vat, his arms vanishing up to his elbows in the thick, dark liquid, and pulls out yards of fabric he had submerged minutes before. He examines his work, resets the timer and presses the start button with his index finger. His index finger is blue--as are his other nine. The distinct color covers most of Rowland's fingernails, like half-chipped polish awaiting a new manicure. It spreads to his hands, filling the creases of his knuckles and palms and fading as it reaches his forearms. He rinses his blue hands in the blue-spattered sink and dries them on a blue towel. He wears a deep blue shirt and blue jeans. "Everything ends up blue," he says. His hands have been stained some shade of this color, a hue between blue and violet, since he discovered the traditional Japanese methods of growing and processing indigo nearly 10 years ago. Now 43, Rowland lives in Bloomington and divides his time between farming indigo, working in his studio, teaching textile classes at Indiana University and collaborating with a growing number of institutions that want to showcase his work. He lectures and holds workshops at universities across the country, and his art, including dyed wall hangings, patterned cloth partitions and various other pieces, has been featured in exhibitions from Australia to New York. You might say Rowland's name has become synonymous with indigo dyeing in the United States, where he is one of a handful of artists who cultivate this art. HIS STUDIO IS LOCATED in the 100-year-old McCalla building on 9th Street, once a Bloomington elementary school. Its walls are old and tired; the doorframes and windowpanes flecked with peeling paint. Creaking stairs lead down to the vibrant blue door that opens into Rowland's basement space. On this crisp Friday afternoon, Rowland has settled into the "crazy rhythm" of dyeing, hard at work on an upcoming installation for Kennesaw State University's Zuckerman Museum of Art in Georgia. This project is an experiment of sorts -- he hopes to determine how much of the flowering plant he must grow and harvest from his six-acre plot to create the striking blue textiles that have become his life's work. He carefully arranges the next piece of light, delicate cotton, imported from Japan, on a handcrafted, fishhook-lined wooden frame suspended above the vat. Stray threads dangle from the ends of the fabric, grazing the surface as Rowland slowly lowers the frame, and the murky pool of dye engulfs the white cloth. He resets the timer. Across the studio, his assistant Jay Garst carefully irons T-shirts, each dyed a slightly different shade of blue. Today, the two are photographing the shirts for another project sponsored by the I FELL Arts Development Group, a community of artists in Bloomington. Rowland rushes from the vat to the tripod and lighting structure set up against the back wall of his studio, grabbing a freshly pressed shirt the color of worn denim from Jay's pile. He quickly hangs the shirt and straightens the collar and sleeves. He knows his seconds are limited. The beeping timer beckons Rowland back to the vats. The photo will have to wait. "This is what life is like trying to do things in three-minute intervals," he says. Along with Japanese indigo farming and dyeing techniques, he has mastered another skill: multitasking. "You do your own photography, public relations and manual labor -- as an artist you do everything," he says. With three more minutes on the clock, Rowland returns to the camera. He directs Jay as she crouches below the hanging shirt, manipulating the light with a piece of thick white poster board. Her fiery red hair keeps peeking into the edge of the frame. Rowland takes a test shot, only to realize he's forgotten the memory card. Jay laughs. She is accustomed to the inevitable chaotic atmosphere of McCalla 002. "I'm always humorously struggling," Rowland says. "But he always comes up with good ways to fix things," Jay adds. ROWLAND'S LOVE affair with indigo began nearly 6,500 miles from his studio. A high school trip to Japan sparked his interest in Japanese language and culture, and he went on to major in East Asian Studies as an undergraduate at Wesleyan University in Connecticut. He spent his junior year studying in Kyoto and, unable to stay away after graduation, returned to the country with the Japanese Exchange and Teaching program, or JET. "All I knew was school," he says. While teaching photography in Japan, Rowland noticed that the sink in the 150-year-old farmhouse where he lived was draining chemicals used to develop photos directly onto the surrounding land. "That got me thinking about how something as benign, or seemingly benign, as art-making really has an impact on the immediate environment," he says. With his teaching contract about to expire, Rowland was introduced through his JET program to artists in the area who worked with natural plant dyes. From them, he first learned about indigo. Indigo was initially cultivated in India, and the oldest known dyed garment dates back to 2500 B.C. The color became popular in the Middle East and Asia, spreading through trade routes to Europe where it signified wealth and luxury. Demand became so great that farms were established in the American colonies with slave labor to support the growing trade. Meanwhile, Japan was following an isolationist policy; the nation resisted trade and interaction with other nations as much as possible. This allowed the Japanese culture, along with their methods of indigo farming and dyeing, to develop untouched by outside influences. The all-natural dyeing process continues today, despite chemical dyes overpowering the worldwide textile industry. Intrigued by indigo's specialized dye process, Rowland searched for a way to learn about this sustainable method of art making. Fascinated by the older residents of his Japanese community and their understanding of how to live in their immediate environment, he wanted to somehow bring their ideas back with him. "It flipped my world upside down," he says. Gradually, he eliminated art-making methods that weren't sustainable and became determined to master indigo farming and dyeing. His JET supervisor connected him with a local indigo farmer, and he began a yearlong apprenticeship. Afterward, he secured a placement with the Furusho family, expert indigo dyers in Okinawa. Rowland met Chinami, now his wife, while studying in Okinawa. "We would all be sitting around chit-chatting, and I realized we talked about what we would do if we had our own studio," he says. The two traveled throughout China and Southeast Asia and later returned to Japan. While Rowland pursued dyeing, Chinami studied under a master weaver, perfecting Japanese "kasuri" weaving techniques. Apprenticeships completed, they brought their knowledge and experience, along with several bags of dried Japanese indigo leaves, to the United States in 2003. Rowland completed his Masters in Fine Arts in fibers at Cranbrook Academy of the Arts in 2005. He and Chinami lived briefly in Tennessee before settling in Bloomington in 2006, enticed by a teaching job at Indiana University and the artistic personality of the town. Two years later, Rowland and Chinami bought land not far from the campus and began to grow indigo, relieved that the plant easily adjusted to the temperate Indiana climate. Neighbors would pass by their six-acre plot, eyeing the pink-blossomed rows of plants or the sprawling blue tarp covered in drying leaves, and sometimes asked, "Is this legal?" Eventually, the Ricketts accumulated enough dried and composted indigo to begin replacing their dwindling supply from Japan. CHINAMI KNEELS on the floor of her quiet, peaceful studio just across the yard from the Ricketts' house. She is spinning wool into delicate thread in preparation for future weaving projects. Two looms take up much of the main room, and finished work sits on the counter by the windows. These are intricate and detailed, taking hours, weeks and months to complete. Rowland dyes the threads and yarns she uses to create kimonos, bags, and sometimes shirts or other clothes. Her work is a harmonious combination of indigo production, dyeing and Japanese weaving. "I knew I wanted to work with my hands and with colors," she says. "I like that all of the things I learned are connecting into one thing." As for Rowland, planting season is quickly approaching, but important tasks still remain on his "ever-growing, never-shrinking" studio to-do list. The finished yards of cotton, now a rich, shade of indigo, must be measured, rolled, labeled and packaged for the exhibition at Kennesaw State. American Apparel t-shirts sit in untouched boxes, waiting to be dyed for Rowland's I FELL project, through which he aims to increase public awareness of sustainable dyeing practices. The American-made shirts will be sold to help fund current and future projects and to "get this beautiful blue color out into the world," he says. On an overcast Friday in spring, Rowland wakes early to begin planting. His house is easily distinguishable by its blue mailbox and the blue roof on Chinami's studio. A greenhouse and chicken coop occupy the center of the field. Inside the greenhouse, gardening tools sprout like weeds from all sides, threatening to overtake the two small rows of soil meant for planting. He begins the planting process by unrolling bags of blood meal and green sand, fertilizers used to balance the carbon and nitrogen in the soil. After sprinkling each evenly over both seedling beds, Rowland opens three bags of precious indigo seeds from previous years' harvests. He grabs a handful and uses his fingers to sift through the mixture, exposing the dark, tiny seeds hidden within the dried plant residue. Careful not to mix seeds from different harvests, Rowland distributes the contents of the three bags over freshly tilled soil. The seeds are then covered with a layer of sand and a seedling sheet to keep out pests and left to grow for a few weeks, when they'll be uncovered and transplanted to a larger field. After harvesting, the leaves are dried and composted and then combined with hot water and other materials in a large vat, where fermentation begins. BACK IN THE STUDIO, sunlight peeks through the back door, propped open to let fresh air dilute the persistent smell of composting plant material. By now, Rowland is immune to the sharp, pungent scent. Artists in neighboring studios have questioned the smell, concerned he was harboring dead animals in his basement workroom. He responds by explaining that the smell comes from the vats of dye, which are very much alive. The vats contain wood ash lye, water, composted indigo and limestone, creating a microenvironment inside the metal walls. Bacteria in the composted indigo thrive on a fiber-heavy diet of wheat bran, which is added to the vat roughly every 10 days. Caring for the vats is a complex balancing act: too much or too little alkalinity could prevent fermentation from starting, and dyeing too much fabric too quickly could kill the vat completely. As an apprentice in Japan, Rowland once killed a vat containing nearly $2,000 of composted indigo. Now, after years of practice, he carefully monitors the vats and can determine the alkalinity simply by the feeling the liquid with his hands. Rowland sips tea out of a chipped mug, cream colored except for traces of indigo. His willowy frame leans against one of the two vats. A giant loom, used by Rowland and his assistant, Jay, to create some of his projects, swallows the middle of the room, surrounded by a random assortment of crates and scraps of fabric and dyed yarn. A once-white laundry basket hangs in the corner above the vats, its original color long ago disguised by the dye. Stained dishes and glass measuring cups are piled by the sink, and a ceramic bowl of clementines sits amongst the clutter. Rowland reaches for one and begins to peel the skin, its bright orange hue a stark contrast to the deep blue of his hands. He takes only a short break before returning to the white shirts waiting to be dyed. This T-shirt project will not be Rowland's first venture into garment dyeing. He has worked for more than two years with American Colors, a high-end clothing company that prioritizes sustainability. American Colors has storefronts in Bloomington and Santa Barbara, California, but its garments are sold in boutiques across the country. The shirts Rowland dyes for the company sell for more than $200 dollars. Owner Shannon Lehr describes Rowland's work as unique and special. "It is such a labor-intensive and extremely valuable way of dyeing," she says. The installation at Kennesaw State will likely require 600 to 700 yards of material, which might have become wasted fabric at the end of the event. Instead, Rowland worked with American Colors to identify a cloth they could transform into garments. All of the material will go to the clothing company to be made into shirts. ROWLAND HAS NEVER wanted to keep the beauty of indigo for himself. He teaches textile classes at IU and helped reshape the school's Master of Fine Arts program in 2009. He's also established a community program called IndiGrowing Blue. Open to the public, the project teaches volunteers to plant, harvest and process indigo. "Rowland is a patient and generous teacher," says IndiGrowing Blue participant Cathy Bullington. Bullington, 49, teaches middle school art and has been involved with the project since its creation in 2010. You have to experience the process. It makes you appreciate indigo and its magic." After three years of growing and harvesting the plants, participants started their first communal vat of dye this year. Rowland hopes that it will continue to develop. "If you don't teach it, and you don't share it with other people, it'll never expand," he says. "There's a real limit to what you can do as one person." His art has been featured in group and solo exhibitions at universities and museums across the country such as the Textiles Museum in Washington, D.C. and the Calvin-Morris Gallery in New York City. However, the recognition is merely a by-product of his work. "I still don't think of myself as successful," he says. "I think of myself as completely exhausted." His workload only looks to increase. He aims to partner with local farmers to grow the indigo and then establish a dye house, offering opportunities for young designers and artists to learn the inner workings of small-scale textile production. Sustainable textiles are a growing trend, Rowland says, but the movement lacks the infrastructure necessary to support development. He hopes to encourage stronger connections between small-scale farmers and artists. Still, Rowland will be satisfied if he simply is able to continue doing what he loves. He believes in indigo, in its long history that has unraveled over the centuries and in its cultural traditions. "It's so much bigger than I am," he says. "I didn't come up with this process -- other people did -- it has nothing to do with me, which is actually very liberating"